24/7 | Live Operator | AS/RS Help - Westfalia Technologies, Inc. Call 1-717-764-1115, select #5 for service, and select #1 for the live operator. The operator takes the message, and begins contacting Westfalia’s primary on-call person in field service. If after 10 minutes and a second attempt the primary person cannot be reached, the operator contacts the secondary on-call person. If either of these two contacts are unreachable or busy with other customers, the service manager will be contacted. Both primary and secondary contacts are part of the Westfalia service department. If Warehouse Management Systems (WMS) or controls support is needed, the service department contacts have primary and secondary controls and WMS employees on-call for specific details and/or dial-in support. 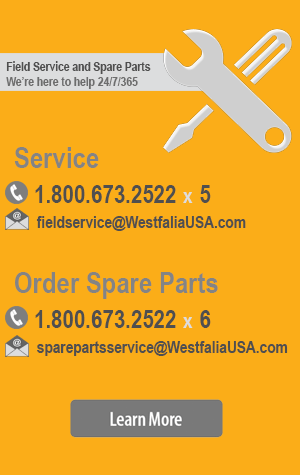 Non-emergency service department inquiries can also be handled via email sparepartservice@WestfaliaUSA.com. Note: calls to this support line may be subject to support changes.